It’s that time of year again. Time for candy canes, gingerbread cookies, and figgy pudding – whatever that is! That’s right, it’s the holiday season and time for me to stuff my face with delicious treats before New Year’s resolutions kick in. But it’s also a time for something even more sinister, that you may not have considered. It’s also the time of year where home fires are the most frequent. Amidst the holiday cooking, festive baking, and Christmas decorations, danger can lurk behind every corner of the home, ready to steal your holiday joy. But don’t get your Christmas lights in a twist, because the Red Cross is here with a few tips on how you can keep your community safe during the holidays. 1. Replace any string of lights with worn or broken cords or loose bulb connections. Connect no more than three strands of mini light sets in one outlet. 2. Choose decorations and artificial trees that are flame resistant or flame retardant. Place the tree away from heat sources and exits. Water real trees daily. 3. Never leave portable heaters or fireplaces unattended. Make sure you have working smoke alarms. Keep any objects at least three feet away. I’m looking at you, stockings! 4. Holiday safety is a true community effort. You can help the Red Cross build safer communities through your holiday generosity. This year your local Red Cross is grateful to be working with the Ventura County Star for the annual Bell Ringer campaign. The Red Cross, along with two other local non-profits, will be the beneficiary or your charitable donations through the program. With your support, Red Cross volunteers will be able to install free smoke alarms and teach local families the importance of fire safety. Click here to learn more about the campaign! We hope these tips will keep your family safe and sound this holiday season. For more Red Cross holiday safety tips, click here. From all of us in your Red Cross family, Happy Holidays! It’s a cold winter night with temperatures dropping below freezing. You and your family are huddled together for warmth along with hundreds of other refugees. Outside you can hear the buzzing of disaster responders working feverishly to secure the area. Other families are sharing an open flame out on the sidewalk for warmth and cooking. There’s no hot water for cleaning or showering. You’re not in a foreign country or war zone. You’re in an apartment complex in Fresno, California. This is the reality that hundreds of local Southeast Asian refugee families are currently facing since the gas was shut off on November 12th due to safety concerns. It’s not a typical natural disaster – it’s manmade, due to neglect. But the City of Fresno called in the local Red Cross to help. The Red Cross distributed nearly 1,000 blankets to the residents, and helped establish partnerships with other non-profits like FIRM and the Southern Baptist Convention to provide warm meals and hot showers. In disasters natural or manmade, community partnerships are critical. 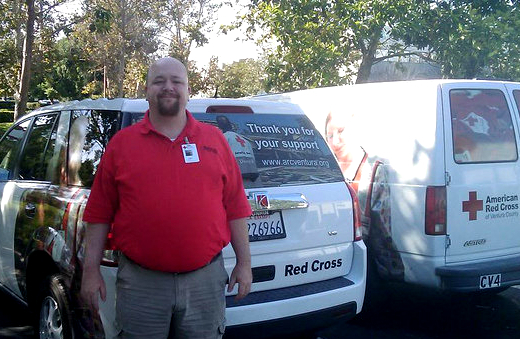 It’s one of the many behind the scenes roles that the Red Cross often plays. The organization often acts as the central nervous system between multiple agencies like the City of Fresno and the Southern Baptist Convention and helps to organize workshops, meetings, networking, and training opportunities for local disaster response groups. But disaster preparedness doesn’t stop there. The Red Cross recognizes that every family needs to be prepared for emergencies. When the Red Cross and City officials got a closer look at the refugee apartment complex, they realized a big problem. Many of these units did not have working smoke alarms or carbon monoxide detectors. With many families using space heaters, open flames, or other non-traditional heat sources, this was a recipe for disaster. The Red Cross immediately took action, installing more than 150 free smoke alarms and carbon monoxide detectors for the residents alongside community partners, translators, and first responders. 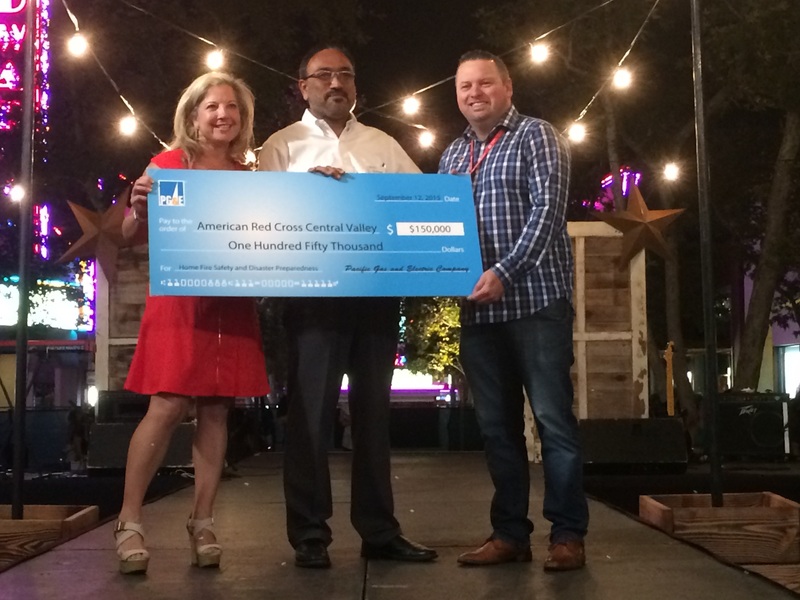 The Red Cross is only able to prepare for disasters and educate local families on the importance of emergency preparedness thanks to the generosity of the community. Through your donations, Red Cross disaster teams are able to work 24 hours a day, 7 days a week, 365 days a year to build a stronger, more resilient Central California. The holiday season is a time for family, reflection, and generosity. Every year people all over the world come together for the global social media event that has become known as Giving Tuesday. After the holiday shopping rush of Black Friday or Cyber Monday fades away, Giving Tuesday is an opportunity to bring people together and celebrate the non-profits that serve our communities. So this Giving Tuesday, consider all the behind-the-scenes details that might take place in your community every day to make sure it’s Red Cross Ready for anything. This Giving Tuesday, consider donating to your local Red Cross. If your family is anything like mine, then you know that Thanksgiving can be a perfect storm of disasters waiting to happen. Take a bunch of loud family members, add a deep fryer, and sprinkle in a few kids and pets, and it’s a recipe for holiday chaos! Clean cooking surfaces on a regular basis to prevent grease build up. Never pour water on a grease fire. Consider purchasing a fire extinguisher to keep in your kitchen. Keep children and pets away from the cooking area. Make sure children are at least three feet away from cooking areas. White meat turkey can be safe for your pet, but make sure to remove any excess skin or fat, and make sure there are no bones. Never leave cooking food unattended. If you’re simmering, baking, roasting or broiling food, check on it regularly. Keep flammable items away from cooking surfaces. This includes oven mitts, towels, or food packaging. Download the Red Cross Emergency App. Get more safety and first aid info at your fingertips. Test your disaster knowledge with fun quizzes and set up customized weather alerts. Most of all, have a safe and happy Thanksgiving holiday from your friends at the Red Cross! Halloween can be both fun and frightening. With Halloween just a couple of weeks away the American Red Cross would like to remind you of a couple of tips and tricks to keep you safe while you trick or treat. Never go into a strangers house, even if you are invited in you should stay on the doorstep in plain sight of bystanders. Not everyone is nice to children on Halloween and someone you don’t know might trick you. Be careful crossing the street. Make sure to look both ways for vehicles before crossing. Wear a bright costume or consider wearing reflective stickers on your costume to help make you visible to drivers while trick or treating. Have an adult you know accompany you on your trick or treating, if this isn’t possible plan a route and make sure somebody knows where you plan to and when you should be back. Watch out for jack-o-lanterns, as awesome as they are they often have a candle inside making them a fire hazard. To reduce the chance of becoming like the inside of a jack-o-lantern wear a tight fitting costume or one that is flame retardant. Only visit houses with a bright porch light, dark porches can have hiding ghouls or the homeowners might not be home. Only walk on sidewalks, don’t walk in the street unless to cross and don’t cut across peoples lawns. If your costume has a prop like a knife, pitchfork, or a sword, make sure it has a soft flexible tip so it can’t cause any harm. Don’t use masks with small eye-holes, they can limit your vision making them unsafe. Instead try to use face paint as an alternative. Have your kids bring their candy back for you to check before they eat it, this is important; you don’t want them eating something harmful. Plus you get to take first pick of their loot! Accompany your kids while trick or treating. If you can’t go see if they can go with their friends parents. If all else fails, plan a route with them and make sure you know when they will get back. Kids are foolish sometimes. Make sure they know the difference between a trick and vandalism; it’s not cool to egg someone’s house. Serve your kids a filling meal before they go out trick or treating, this will help them from overeating candy and becoming sick. Warn your kids to be kind to avoid any stray animals they find at night. If it is a friendly pet, make sure they know not to feed it candy or hurt it in any way. Make sure your porch and pathway is well lit, this will help prevent tripping or confusion as to where little goblins and ghouls should walk. If you won’t be home, leave a note at the door letting trick or treaters know that you are not there and can’t offer them candy. Keep any household pets inside. Even though you may love your dog, it may frighten small children if it starts barking. Use LED bulbs or glow sticks in pumpkins instead of traditional candles to prevent any chances of a fire (glows sticks also have the benefit of looking scarier). Clear your porch and walkway of any obstacles that might cause anyone to fall over. Stay vigilant. Halloween is a spooky time, if you see something that looks out of place or a possible safety hazard let someone know so they can fix it or avoid it. Don’t stay out too late. Although Halloween is a night of fun and shenanigans head home a little early, the later you stay out the greater chance something bad could happen. Have fun! Remember Halloween is a holiday, try to enjoy it and you might find yourself acting more like a kid than you thought possible. Eat lots of candy and watch a scary movie or two! I’ve been asked why we wanted to create a cycling event with the Red Cross throughout the course of our involvement by many friends and family. Until very recently, I thought I had a great story: when I was younger I couldn’t afford a car and when I could they broke down. So I would ride to and from work and school on my bike. This led to longer rides and culminated with a ride across the country as part of a charity event benefiting the American Cancer Society. I have done numerous rides for various charities over the years and was always a blood donor for the Red Cross. One day my wife and I were talking about how the Red Cross should do such an event. In fact, I became adamant that the one thing all those rides had in common was that they all probably received support from the Red Cross in some form or another. 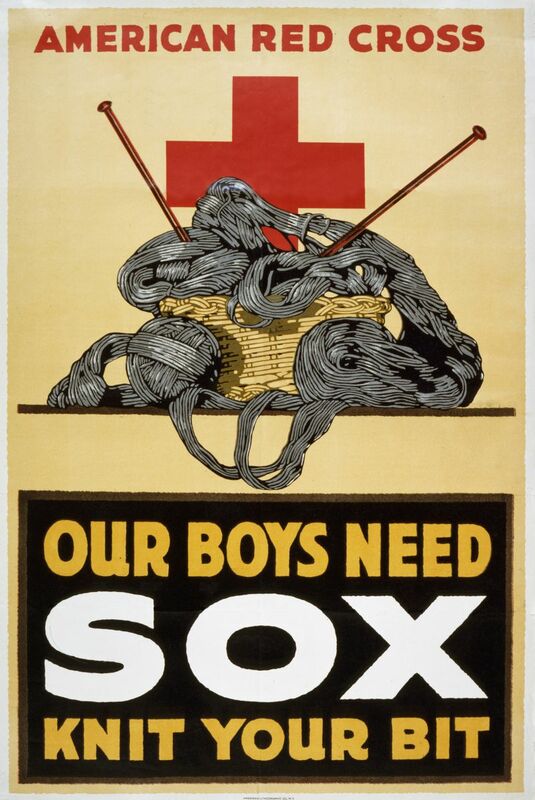 Why not give the Red Cross something back? The rest of the story is simple, we told our friend Ken Bauer who is on the local Red Cross Board and he wanted in,. We pitched it to the local CEO and BAM! We are putting together the 1st annual Operation: Ride for the Red bicycle ride to support Service for the Armed Forces, a program built to help local retired and active service personnel and their families. Given the location of a Red Cross office in Camarillo and that the routes going along two of the Ventura bases, it seemed a natural fit. So what is my new story or explanation as to why we’re doing this? I was sharing our efforts with my Mother, Faye Delson, and she shared with me her involvement with the Red Cross. During World War II when both of her older brothers went oversees she was left to help her single mother raise her two younger sisters and find work where she could. They happened to live near a Red Cross building and one day she decided she wanted to help but didn’t know how. The solution came from a Red Cross volunteer who offered to teach my mom how to knit. They would provide the materials, only if she would make a Red Cross sweater that would be sent overseas to a serviceman. She did, and has spent a lifetime knitting and later crocheting. I have watched her create many blankets over the years and never knew why she did it. When she told her story to me I could see in her eyes that she was proud her son was paying back a gift of a lifetime. So now I just say I am doing it for my mom! The first annual Operation: Ride for the Red event takes place on Saturday, November 7, 2015. Registration is still open – join us today! The other day I arrived at the office to find a really nice surprise. 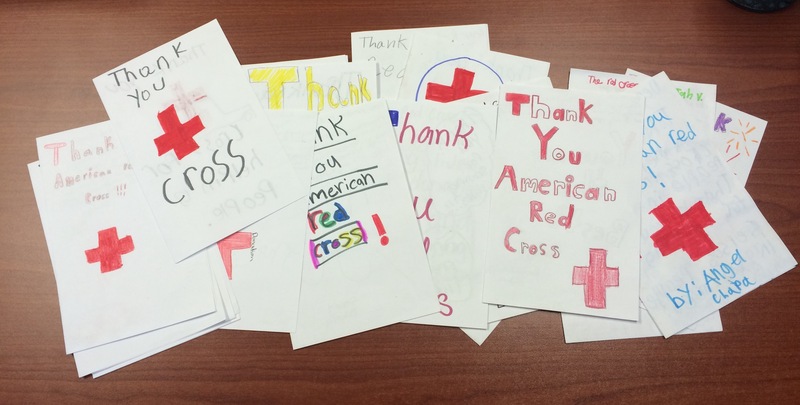 On my desk were about two dozen hand-colored thank you cards from students in Sanger thanking the American Red Cross for all of the life saving work they do throughout the Central Valley and the world. As I read through each card and considered the time that was put into each one, I was really moved by the fact that a group of fifth graders would take the time to thank the Red Cross in such a special way. This got me thinking about the importance of gratitude. In an age where everything is fast paced, it is easy to be moving along our day so quickly and forget to practice gratitude. Our lives are hectic; often jam packed with meetings, conference calls, soccer practices and deadlines. These things can easily derail us from practicing a life of gratitude. In the last month, our team of staff and volunteers has responded to over three dozen home fires, canvassed neighborhoods to teach preparedness and install smoke alarms through our Home Fire Campaign, taught CPR & first aid courses, supported our nation’s veterans at local stand down events and supported our region at fundraising events and community partner luncheons. The amazing work of the Red Cross would not be possible if it were not for the continued efforts of our staff and volunteers who are so committed to our mission and to them I express my gratitude. I also want to express gratitude to our partners and donors who make that work possible. The average home fire response has a direct cost to the Red Cross of $2,200. The life-saving work of our volunteers and staff simply would not be possible without the generosity of our donors. It is our partners and donors who, with their generosity stand with those who are affected by tragedy and I am so thankful to them for their support. It was a wonderful gift that a group of fifth graders gave to me this week. Yes, of course the cards were beautiful and I am so grateful for their words and their creativity. More than that though, they helped me to slow down and remember why I want to live a life full of gratitude. We have so much to be thankful for and it is an unspeakable privilege for me to work with such amazing staff, volunteers and donors here at the Red Cross.